There are four years, Fleetwood Mac gave a concert at the Zenith in Paris, the first after nearly 30 years of absence in France. Last night Stevie Nicks, Lindsey Buckingham, John McVie and Mick Fleetwood had targeted larger, invading Bercy (sitting configuration), which did not display completely full at the start of the show. Surrounded by four additional musicians, Fleetwood Mac started out with a bang, linking three tracks on the album "Rumours" recently reissued. The sound is powerful, bass shook the bleachers, and Mick Fleetwood hits his drums with the precision of a metronome. Come hand in hand, Lindsey Buckingham and Stevie Nicks take center stage in turn. 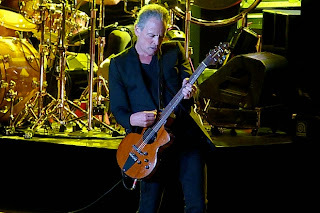 Buckingham, a cross between Sting and Art Garfunkel will show throughout the 2:30 show what a great guitarist he is. Accurate, it has a unique sound and deliver solo anthology ("Big Love" alone on stage), cheered by 10,000 spectators. Nothing to say no more about Nicks who carry the crowd with a stripped down rendition of "Landslide" sublime. Very comfortable, she says her love paris, dedicating a song to Anthony, a server she met on the Ile St Louis or launches into a very, very long explanation before song "Without You." But after an hour and a quarter together, the atmosphere begins to fall. Already she was not boiling hot, the fans of FM being rather discrete nature of ... Stretching titles, Fleetwood Mac tired and bordering on unbearable with too lengthened versions of "Gold Dust Woman" and "I'm so afraid. " A "Go your own way" at the end of a little set back on the flame, like "Do not stop." But nothing to do, if Fleetwood Mac has always been a blues band since its inception in 1968, this furrow dug too last night in Paris was ultimately boring and disappointing. Damage. I was in Bercy and I spend a very good time !!! !